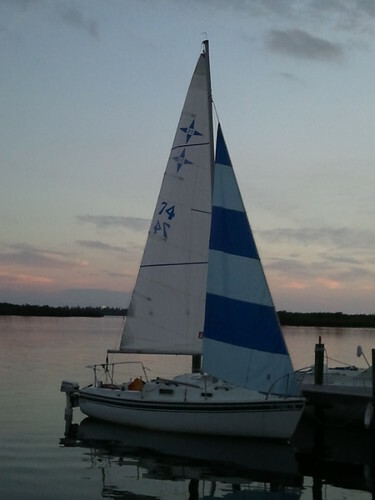 Although I’ve been in FL for nearly a week now, this evening was the first opportunity to see how the new sails fit on the Montego. You may recall that the mainsail is from a Windrose 20, and I bought it from a nice guy in Idaho. The headsail is the working jib from the Balboa – but it’s more like a small genoa on the Montego. I think they look pretty good. 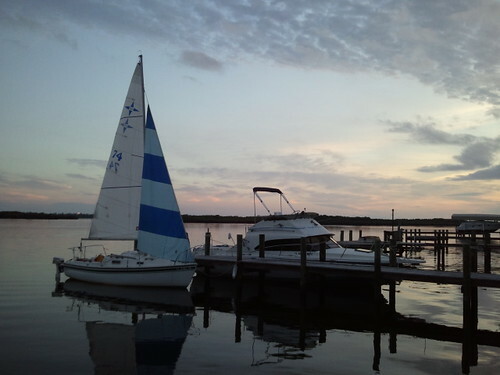 Sharon and I plan to take her out for a sail in the morning, and we can’t wait! you wouldn’t by chance still have this boat do ya??? Sorry man, sold the boat about a year and a half ago! I used to moderate a Yahoo group called montego sailors, maybe check that out. There was also one called lost Laguna sloops, for your windrose. Good luck!